A feast for the eyes by Tiffany & Co., November 2016. Well well well. What a difference a year (and an election) makes. In November 2015 when I made my annual nighttime trek to the see the holiday windows at Tiffany & Co., I pretty much had the place to myself. This time out, I shared it with the NYPD and the Secret Service. Nothing like men in full tactical gear and carrying machine guns to make a gal feel safe! I am only saying that partly tongue-in-cheek: As a former Navy brat, I am not fazed seeing men with assault rifles. No biggie. But the President-elect of the United States of America living literally next door to where I go every year to see the holiday windows? That rattled me. I knew I had to try to see them anyway. It’s my tradition! Barricades on 57th Street from Madison Avenue to Fifth Avenue. Trump Tower is next door to the flagship boutique of Tiffany & Co. (in fact, I do believe his second daughter is named for the famed jewelry company). And with the election results having angered so many people, I knew I was in for something very different this year at 57th Street and Fifth Avenue. Tiffany & Co. is already taking it on the chin for their proximity to Trump Tower—they cancelled their window unveiling event, scheduled for the November 14, because of the protests over the President-elect and the new security chaos in midtown Manhattan. I almost didn’t go myself. Fun crowds are one thing, angry post-election crowds another, and I did not want to hang out with the protestors, I just wanted to revel in beauty! And once I made my way up 57th Street, Tiffany did not disappoint. ...but of course, it’s Manhattan! Loved the fireworks and the T Tiffany bangles. A window featuring a rendition of Rockefeller Center. 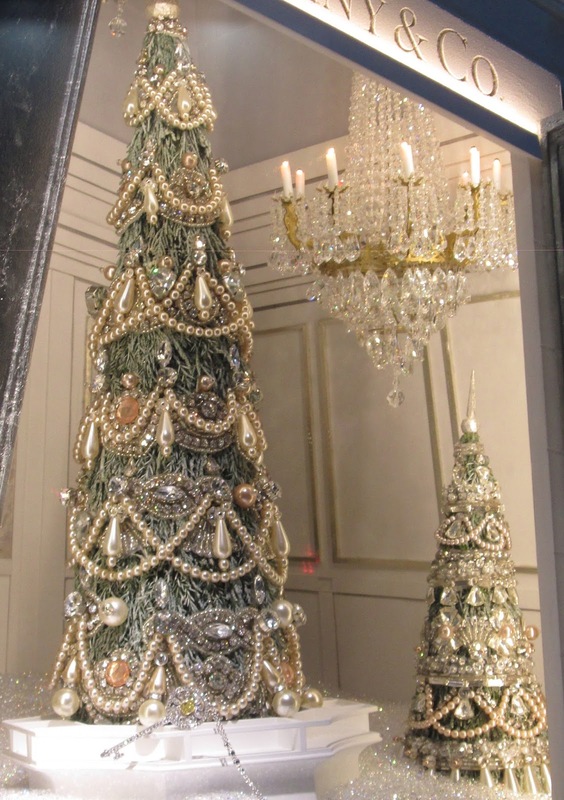 Love this bejeweled Christmas tree! Love the framing detail too. My favorite window, by far, featured an elaborate and elegant table set with Tiffany china and silver and grand desserts and sweets, all in miniature. On each plate was a beautiful piece of jewelry. Gorgeous! One table I would like a place at! Looking up toward the top of the table. Amazing! As I approached the corner of the store at Fifth Avenue, there were many more barricades and police officers, but no civilians. 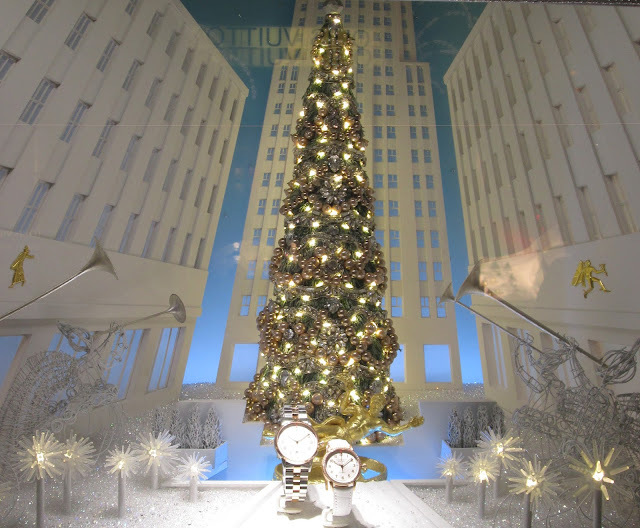 I very nicely asked one of the three cops at the corner if I could take pictures of the window on the Fifth Avenue side of the store, that I come here every year just to do this. He gave me a quick considering look, said, “Come’ere,” and opened the barricade to let me in! He didn’t even check my bag when I offered it. I tell you, my faith in humanity was restored for another day by that one simple act. He decided to trust me! 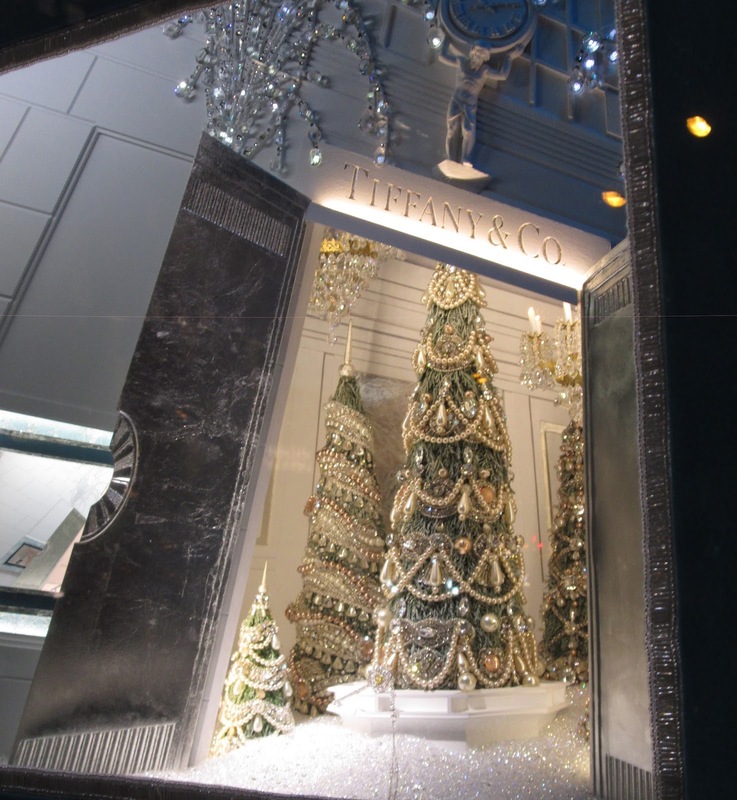 And may I just say that it is absolutely the BEST having several foxy men from the NYPD watch over you while you snap away at the window of Tiffany & Co., on Fifth Avenue, in New York City, especially when you do not have to share the window with anyone else! Whee! 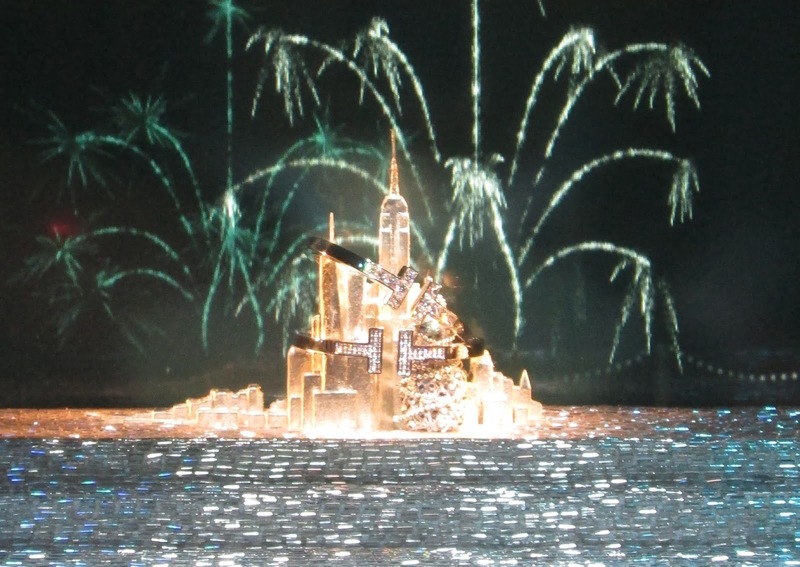 The photos below are from one of the two Fifth Avenue windows. 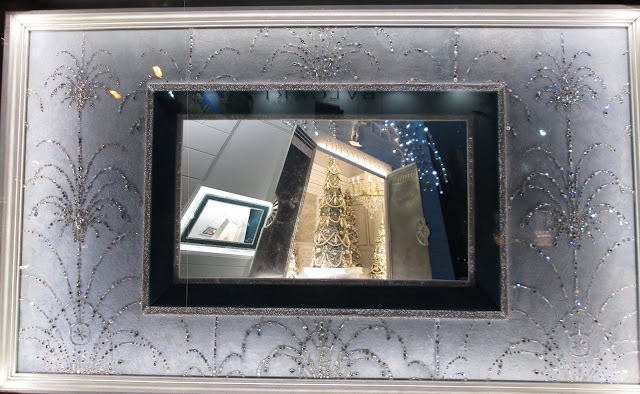 The front of the Tiffany & Co. store in miniature! I love the chandelier and trees. Here it is from another angle, showing even more trees. 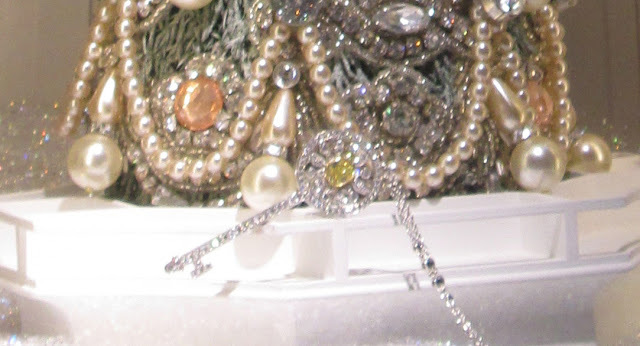 It did not escape my notice that a Tiffany Key necklace was shown in front of the trees. Another Tiffany entrance in miniature. After I got my shots, I thanked the officer for letting me in. I also thanked him for his service. And now, for anyone who is coming to Manhattan for the holidays, below is my photographic take on midtown on a Thursday night, with no protest planned, and no weather, and it was nearly 10pm. It will be quite congested during the holidays, since Fifth Avenue is always a bit of a zoo in December and that was before Trump got elected. Unfortunately, Trump Tower is close to so many places people want to visit, whether you live here or are a tourist, including Tiffany & Co., Bergdorf Goodman, Van Cleef & Arpels, Louis Vuitton, the Plaza, the Apple Store, and the south end of Central Park. If you can go to this area at night, I would highly recommend it. I would also recommend checking Twitter using the hashtag #notmypresidentnyc to see if any protests are planned or actually happening on the day or night you want to visit. It is not just Fifth Avenue that is impacted. Madison Avenue has a large police presence around 56th Street, and I noticed NYPD mobile command units, which are huge trailers, parked on both 56th and 55th Street off Fifth Avenue, shutting them down to traffic completely. I also have to warn people that I walked uptown from 20th Street and Third Avenue and found road work crews EVERYWHERE! I came across FOUR separate repairs or night digs, lights ablazing, during my jaunt up and down Manhattan that night. So take mass transit and be prepared to walk too. The jeweled sides of Tiffany were not lit up like they normally are. On 5th Avenue looking uptown at 57th Street. Quiet for one night but note the barricades. Tiffany & Co. on the left, Trump Tower on the right. And a broadcast journalist front and center, about to go live. There were several journalists reporting that night. Just a few protestors, and they were kept down the street. The good news is that if you walk south down Fifth Avenue, by time you get to the Cartier Mansion at 52nd Street, the barricades are gone and it is back to Life As You Know It. The mansion is all wrapped up and ready for the holidays, by the way, looking quite lovely. The Cartier Mansion looking spiffy for the holidays. And look ma, no police! 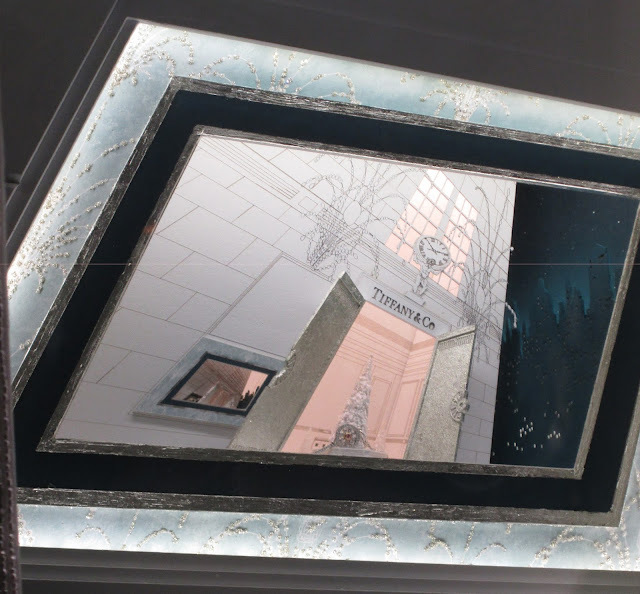 I want to end this post on a positive note so let’s mediate once again on the beauty shared with the world by the window designers and artisans at Tiffany & Co. I am so grateful for all their creativity and hard work! Oh my! Those windows and displays are gorgeous. When in Paris I encountered quite a few groups of the army with their AK47's and it was a wee bit unsettling...on one hand I felt safer that they were there, but on the other hand I wondered what did they know that I did not! Hi Hostess, I think NYers are used to seeing more security because of the precautions taken after September 11. For instance, Grand Central Terminal has never been the same! Armed National Guardsmen, cement barricades, etc. So I am not surprised midtown is in partial lockdown at the moment. I am glad I went to see the windows anyway, and I think the NYPD is doing a fantastic job of letting protestors do their thing but letting us window admirers do our thing too. I am so grateful to them. Hi Debbie, thanks for stopping by and thank you for the compliment! I always love these posts you do each year. I'm glad you managed to still get the photos to share. That one of the dinner table is just amazing. A fairytale within a dream. Just got back & need to go into the City for a variety of reasons. Usually LUV the Holiday Season here. However, this year is different & wasn't looking forward to all the turmoil & protests in NYC. Your great post did lift my spirts & am starting to get a much happier feeling about the Holidays & NYC. Of course I'll share pictures if I can get the pictures. A Happy Thanksgiving to your & your family. I read in Trump's "The Art of The Deal" when it first was published how he got the air rights over Tiffany's for $5mil a fraction of it's market value. Tiffany's then owner only became aware of his poor biz judgement after doing a handshake deal with Trump but nothing in writing. Tiffany's owner was good to his word and kept his handshake deal. 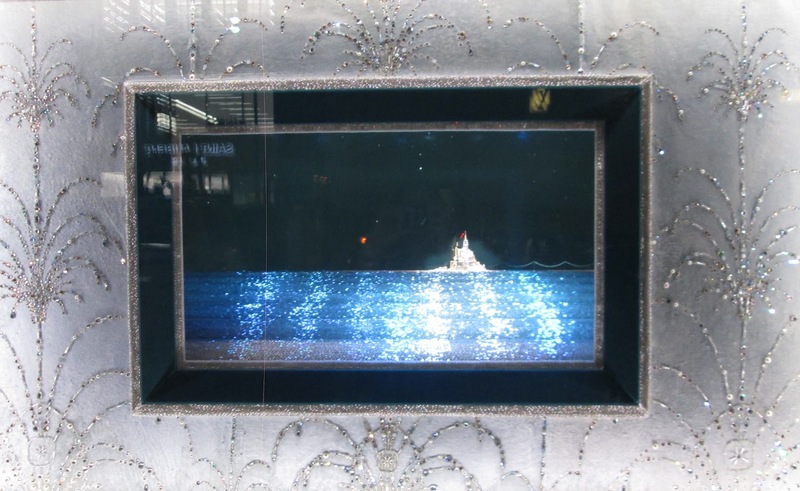 Can't wait to read your Bergdorf Xmas window post.